Almost everyone had heard of Vitamin C. For most of us, it’s a tablet or packet of Emergen-C we take if we’re looking to boost our immune system. But what about when it comes to skincare? Vitamin C is one of the most powerful ingredients to have in your routine, and I’m here to explain why. Vitamin C has various benefits, and its largest effect is brightness. If you have dark spots, hyperpigmentation, or just feel your skin is looking dull this ingredient will help. It fights oxidative stress and the appearance of skin aging before it starts. Undoing past damage while preventing new, what could be better? Vitamin C enhances your skin’s natural defense system being a powerful antioxidant. Think of it as the lime you squeeze over your avocado! Using this will produce brighter, firmer, more radiant skin. So now that I’ve told you all about it, I bet you’re dying to incorporate vitamin C into your routine! The solution: Dermalogica’s Biolumin-C Serum. This serum is specifically formulated to brighten, firm, dramatically reduce the appearance of fine lines and wrinkles. It also includes an AHA, lactic acid, which will help mildly chemically exfoliate to aid in brightness. Add in some peptides and you have one powerful serum on your hands! You can use it morning and night, right after toning and before moisturizing. 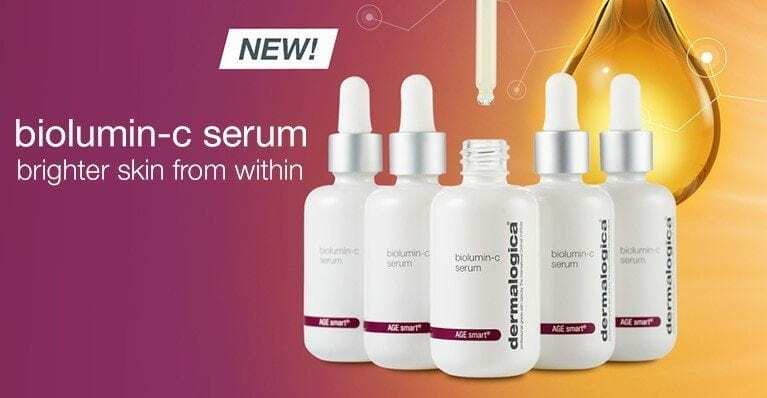 You can stop into Public Image today to pick up the Biolumin-C serum and feel free to ask me any questions.